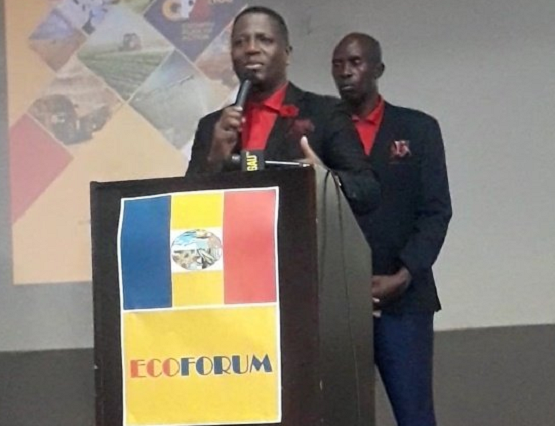 EcoForum vows to fight "monopolistic behaviour" - SABC News - Breaking news, special reports, world, business, sport coverage of all South African current events. Africa's news leader. , Langa expressed confidence that his party would perform well in the forthcoming general elections. The Economic Emancipation Forum (EcoForum) says South Africa’s problems can only be solved by an all-inclusive government of Unity. Addressing the media in Centurion, south of Pretoria, Langa expressed confidence that his party would perform well in the forthcoming general elections in May the 8th. EcoForum is the newest addition to the ballot paper and it’s determined to make an impact. The party wants to focus on addressing social and economic injustices which they found to be affecting South Africans. The party was established in 2013 in Hammanskraal as a social movement. And now with its first elections contest, EcoForum has established branches in all nine provinces. Land restoration is among their top priorities. “We believe it’s about time for South Africans to know the truth about the matter. So, when you expropriate land from the private owner, without their consent, it’s a provocation of unwanted civil war and an erection of informal settlement,” Langa argued. If given enough votes and power, the party says it will assist former Bophuthatswana workers who allegedly never received their pension payouts. EcoForum has been actively involved in the former Bophuthatshwana homeland in a bid to get pension payouts for retired workers from that era. The party is calling for the scrapping of provinces and says this will ensure service delivery. Jubilee Mall in Hammanskaraal is where EcoForum will hold a pre-election rally this weekend. The party has a zero tolerance stance to anything that seeks to promote monopolistic behaviour. Langa says EcoForum will focus on building an inclusive economy while championing the role of churches and traditional leaderships.